After reviewing the books I am wondering how you guys handle Capital Ship combat? I've looked over the various versions of the rules and no matter how you slice it it seems fighters can't do damage to Capital Ships. While this mostly matches what we have seen I am thinking of allowing my players to spend a Force Point to damage them if absolutely necessary. The rules mechanic for doing this would be to apply the Optional Damage Rules from Rules of Engagement (it's a 2E Rule, but a lot of 2E rules can be retroactively applied to 1E to great effect). My preference is the 1/3 variant; for every 3 points by which you beat the To Hit number, increase Damage by 1. So, if your character were to spend a Force Point on their Starship Gunnery roll, that has the potential to generate a significant damage bonus. Another suggestion would be to apply a different Scale system to the 1E rules, specifically, one that moves the smaller capital ships 2D closer in Scale to Starfighters. If you think about it, there are plenty of examples of out of scale damage being done. Probably most examples come from Rogue One (Y-wings and X-Wings damaging and disabling a star destroyer, Chirrut one shotting a TIE fighter, etc) but there are other examples. The X-wings destroying parts of the Death Star in ANH, snow speeders taking out disabled walkers in Empire, a lot of the space battle in Jedi. But yeah, the rules don't have an easy way of doing this, so I home brewed something up, mostly based around the stuff in Rogue One, but I think it works well for all situations. Please let me know what you think. A starfighter can make an attack on a specific system or part of a capital scale starship (Like the bridge deflector shields, or a specific turret) and their damage roll will not be modified. However, the attack roll will also not be modified. Also, you can not destroy a ship with this method, only destroy the system (if you rolled a destroy result, that only destroys the object being aimed at). Now, per GM will this could lead to the ship crashing (for example destroying the bridge of a star destroyer could lead to it crashing) but it is not for certain. Example. An X-Wing attacks a Star Destroy. Normally the X-wing pilot (4D skill) would roll the 4D plus 2D for his torpedoes plus the 6D scale difference for a total of 12D. Then if he hit, he would roll his 9D torpedo damage against the 7D hull, 3D shields, and 6D scale difference of the Star Destroyer for a total of 16D. However, lets say he just wants to attack the shield generators. That is a called attack, so he would only roll 4D skill plus 2D for Torpedoes. But to resist, the star destroyer would only roll its 7D hull and 3D shields against his 9D damage. This may also be used for any difference in scale situation where the difference is no more than 6D. A group of more than one fighter or other starfighter scale ship may make a combined attack if using the same type of weapon. This counts as an additional action that can be completed by a copilot or astromech that needs to pass a moderate difficulty computer programming/repair. If the check is successful, then each pilot rolls an attack roll as standard, and for each additional weapon fired that hits, add 1D to the total damage roll. There is a group of 6 y-wings making an attack run on a star destroyer. They are going to fire their proton torpedoes as a group. The astromechs all make the roll and then the pilots fire as one unit. The base damage is 9D, however, there are five torpedoes after the first, so 5D is added to get 14D. Meanwhile the star destroyer has 7D hull, 3D shields, and 6D scale difference for a total of 16D. Not an impossible shot. A group of more than one fighter or other starfighter scale ship may make a combined attack if using the same type of weapon. This counts as an additional action that can be completed by a copilot or astromech that needs to pass a moderate difficulty computer programming/repair. I use similar rules One and Two, but for Two I use Tactics and/or Command for combining actions rather than Computer Programming/Repair. I let players attack specific targets/systems on cap ships, like Saikoyu. My general rule is systems resist damage at 4D at one scale size smaller. So a capital ship turbolaser resists damage at 4D starfighter scale. Additionally, unless the starfighter is at point blank range, they still have to shoot through the capital ship's shields. And yes, cap ship ray shields get +6D to resist against starfighter scale weapons. However, Ray shields only block lasers, they do not block torpedoes or ion cannon fire. In other words, starfighters can damage cap ships if they're flying along the super structure of the capital ship, like in RotJ. Or if they combine fire with other snubfighters, but that has its own problems. Capital Ship Combat was brought to the First Edition game in the Rules Companion. Before those rules, the game considers capital ships as more background material than anything else. Sure, you get stats, and you can use the starship combat system provided in the 1E core rulebook, but those rules are really intended for fighters and ships the size of the Falcon. The 1E starfighter combat system is re-worked in the Rules Companion (and I don't care for it as it makes the rules more rigid), and the Capital Ship Combat System is based on those re-worked rules. The Combined Action rule is brought to the First Edition game via the Rules Companion, too (one of the few rules that I like from the RC), and when capital ships fire at each other, a version of these rules is used so that each capital ship gets one attack at one target. So, you'd roll once if you had 60 turbo lasers firiging at a foe, and you'd roll once if you had 15 ion cannons firing at a foe. The difference is the single attack representing the 60 weapons would get a bigger to-hit and damage bonus than the roll representing the 15 weapons. 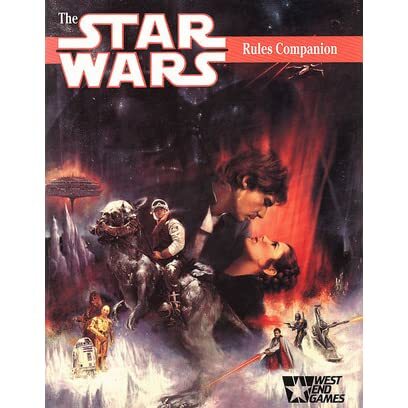 I don't like the haste rules so I didn't really look at the Rules Companion as much as I should. I will use those capital ship rules if the need arises. The scale system of 2E R&E seemed a little too drastic but Capital Ships should have a little more survivability. I don't like the Haste Rules, either. There's some good stuff and some not so good stuff in the RC. It's probably worth getting and then cherry picking what you want out of it. For example, it introduces variable difficulty numbers to 1E. That's good. The haste rules are an acceptable way to simulate gunfights like one saw in a lot of old Westerns, i.e. Ready - Set - Draw! Unlike the rules in basic 1E where the first shot is also the most accurate shot, the haste rules require the player to choose between more speed and greater accuracy. This allows for a result where a gunfighter might beat his opponent to the draw, but miss his shot. That's a damn good point, man. Thanks for opening my eyes to it. What you say about 1E is not quite true. A 1E combat round where a Rebel and a Smuggler are shooting at each other. That's a d*mn good point, man. Thanks for opening my eyes to it. Change "Rebel" to "Rodian" and you've got yourself the makings of a Special Edition controversy right there. Side note: sent my 18-month-old to daycare yesterday wearing her "Han Shot First" T-shirt. Correct, sir! I was actually thinking about that scene when I wrote the example! Your example only works because the to-hit number for the two combatants are different, specifically the to-hit number the Smuggler needs to roll is significantly lower than the to-hit number that the Rebel needs to roll. While that can happen (if they are using different weapons, if the first shooter has to fire through or around cover, etc.) it only works because the second shooter has to roll vs. the lower to-hit number. Whenever the two shooters have the same target number for their roll or the second shooter has a higher target number you cannot have a hasty first shot that misses followed by a well targeted second shot that hits. In the example of Han and Greedo, they both have blasters (Han’s is a heavy blaster) and they are sitting within 1.5 meters of each other, so both are at point-blank range. Han is firing through the table so Greedo has cover which makes him harder to hit. This means Han has to roll a higher to-hit number. Which means that if Greedo gets the first shot using 1E initiative rules, then Greedo shoots Han first. And using 1E damage rules, Han is at least stunned and falls face first onto the table and Greedo takes him to Jabba to collect the bounty. Was just trying to show you that 1E allows for second shots to hit. It's not always first shot hits first.